Nels Cline’s latest album is reviewed. On September 29, Heterodyne will perform two sets at DC’s Art All Night celebration at Blagden Alley (access is from the west side of the 1200 block of 9th Street NW). The first set will begin at 8:30; the second at 10:30. The performance will feature NPR’s Bob Boilen; poetry by the late Susan Mumford, one of Bob’s collaborators in Tiny Desk Unit, will be read while Heterodyne performs. Flutist Ellen Burr and bassist Jeff Schwartz continue their monthly third Thursday residency at the Industry Cafe & Jazz in Culver City, known as “Thirdsdays,” with a special show October 18. For the first set, at 8pm, they will be joined by guitarist Derek Bomback and drummer Peter Valsamis to collaboratively improvise on material ranging from Icelandic folk songs to theatre games. The second set, at 9, will be by the all-Canadian guest trio of Valsamis, legendary bassist Lisle Ellis, and alto saxophonist Yves Charuest, whose bio sports work with Peter Kowald, Louis Moholo, William Parker, members of Sun Ra’s Arkestra, and other icons of the avant-garde. 6039 Washington Blvd, in the Arts District. Roscoe Mitchell’s 2018 reissue of Sounds is reviewed. 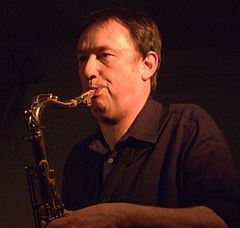 John Butcher’s new album encompassing 20 years of multiple saxophone compositions is out.